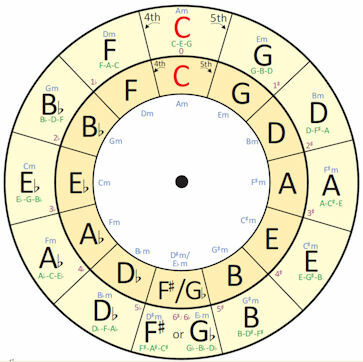 A reminder to CPLUG members to download and print the Circle of Fifths/Chord transposition wheel as shown on the right. It’s a useful tool for learning how chords work together, as well as for changing the key of a song. There are two versions: large and small. They are identical, except for size. keep the small one in your ukulele case with you. Print these pages single-sided on card stock or thick (28 lb) paper. Laminate all pages (you can do this at any office supply/service store like Staples or The UPS Store). You may want to print and laminate page one twice so you have the full colour wheel. Cut out the larger wheel out from page one. Cut the second largest (inner) wheel from the second copy of page one or from page two (cut along the darker line between the keys). Punch a hole in the centre of both, insert a round head paper fastener and use! I’ll be referring to this wheel in upcoming get-togethers and it will be required for any discussions we have on music theory. To transpose a key, pick the song’s original key on the inner wheel and then rotate that wheel so that key lines up with the key you want on the outer wheel. Then play the chords shown on the outer wheel instead of those shown on the inner wheel. For example, say the song is in C and has the chords C-Am-F and G. You want to play it in F. Turn the inner C to the outer F. A lines up with D, F with Bb and G with C. So the new chords are F-Dm-Bb-C. Easy!